While making my way through this ridiculously silly and highly entertaining novel, I couldn’t help but think of that age-old rule about family: We’re permitted to make as much fun of our own families as we want, but just let someone else try. They’re likely to be sorry they ever lived. The same holds true for Georgia Bottoms. If any writer above the Mason-Dixon line had dared to pen this comic novel, it would have raised the hackles of its southern readership. But Mark Childress is from around these parts, so he gets a pass. 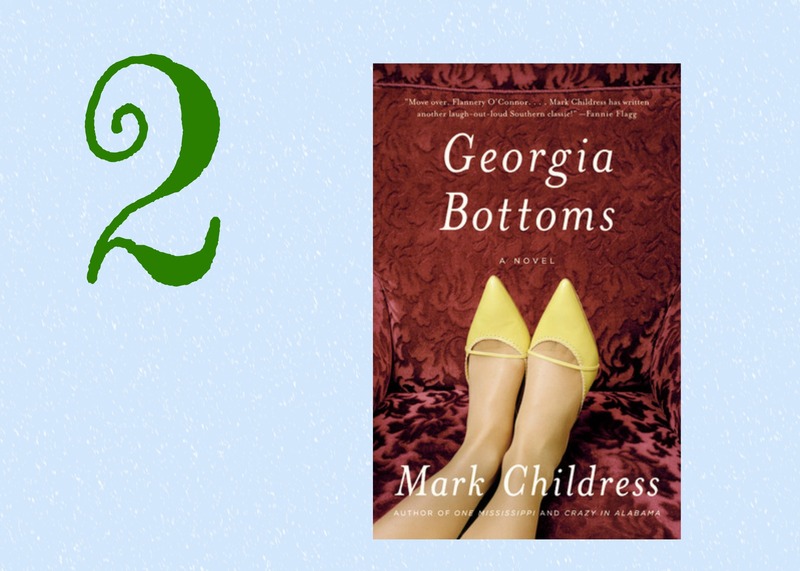 Here, as in his 1990s novel-turned-movie Crazy in Alabama, the Monroeville, Alabama, author takes his southern roots and twists them into a tale that will have you laughing out loud—or snorting, if you forget your upbringing for a moment. Every page in Childress’s farce is covered in southern stereotypes and clichés, though readers will come across a few kernels of truth as well. The novel’s heroine, Georgia Bottoms (whose surname would have been Butts, if one of her forebears hadn’t changed it to the more respectable “Bottoms”), gives readers all kinds of reasons to criticize, condemn, and dismiss her. But you’re likely to end up liking her. She schemes her way through every situation, and her every move seems calculated for her own benefit. When the events of 9/11 interrupt her annual ladies luncheon, for instance, her primary concern is what to do with the mounds of leftover Jell-O compote and Coca-Cola cake. In the end, relationships prove the most important thing in Georgia’s life, making her a true southern girl at heart. This novel is as shallow as Day 1’s pick (Karen Joy Fowler’s We Are All Completely beside Ourselves) is deep, so pick it up when you’re more in the mood for wading than taking a real swim. In any case, it manages to make a splash. With all our rushing to the grocery, scurrying around the stove, and waiting on line to pick up a turkey, it’s easy to overlook the opportunity to observe Thanksgiving in any true sense. I, too, am about to head to the kitchen, where I’ll spend the better part of the day. But before I do, I’m taking a moment to read a new offering from Flannery O’Connor (1925–1964), one of the greats in American literature. 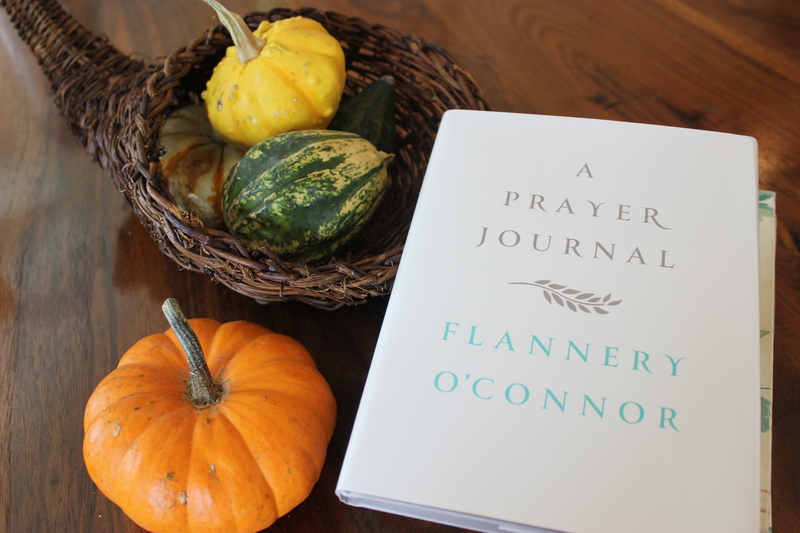 Last week saw the publication of A Prayer Journal, a slim volume that records O’Connor’s dialogue with God while she was a 20-something writing student at the University of Iowa. Though the 1946–47 journal only recently surfaced among her papers in Georgia, O’Connor’s Christian perspective is familiar to readers of her fiction. A devout believer and a member of the Catholic faith, her short stories and novels deal openly with the ideas of sin, redemption, and grace. Like her fiction, her prayers blend strong devotion and faith with moments of irreverence and wit. Here are a few spiritual kernels for you to chew on before tomorrow’s feast. 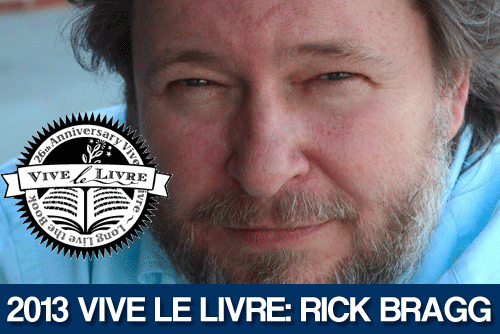 I had the pleasure of hearing Alabama writer and story-teller Rick Bragg last night at Huntsville’s annual Vive le Livre event benefiting my own local library, the Huntsville–Madison County PL. It was, as one friend put it afterward, a jaw-crippling sort of night, where you laugh so much that the corners of your mouth ache by the end and it hurts to bite down on the fried peach pies offered up at the dessert reception. It was also a night that had us all rallying behind the power of books, our Southern heritage, and community libraries. For some reason, rich people in the South like to hold their events in outdoor tents in the summer, even when there is perfectly good air-conditioning available. Many of us apparently like to pay big bucks to sweat. Libraries are where the books live. Even when you come from a home like Bragg’s, where the only books are a Bible and a seed catalog, you can find your way to the local library, where the Hardy Boys and the Boxcar Children live. Libraries will let you read all the books you could ever dream of (and, apparently, some libraries in Calhoun County, Alabama, will still let you even when you rack up about, oh, $45,000 in library fines). Southern writers are always more at home in front of a southern audience, because there’s no need for an interpreter. The writer’s muse isn’t a beautiful gossamer fairy that floats to us through an open window; it’s a Lord of the Rings Gollum-type ghoul that we have to wrestle, pin down, and force our stories out of. And it’s a contract, with a deadline. When a Southern boy with means loves his momma, he’ll buy her a new house just because the old house he bought her had too many lightbulbs. In theory, when a Southern boy asks his daddy how to fight, his daddy would want to talk to him about Gandhi and about Martin Luther King Jr. In reality, the daddy will teach his boy to land one punch right between his opponent’s eyes, the surest way to make sure it’s the other kid who’s bloody and crying and not himself. Being a professional writer seems like the easiest job in the world when you put it beside picking cotton, a back-breaking job that pays by the pound for something that’s light as air. No one likes the process of writing. We like having written. Thanks, Rick Bragg, for telling us some things about ourselves we already knew—and a few we didn’t.